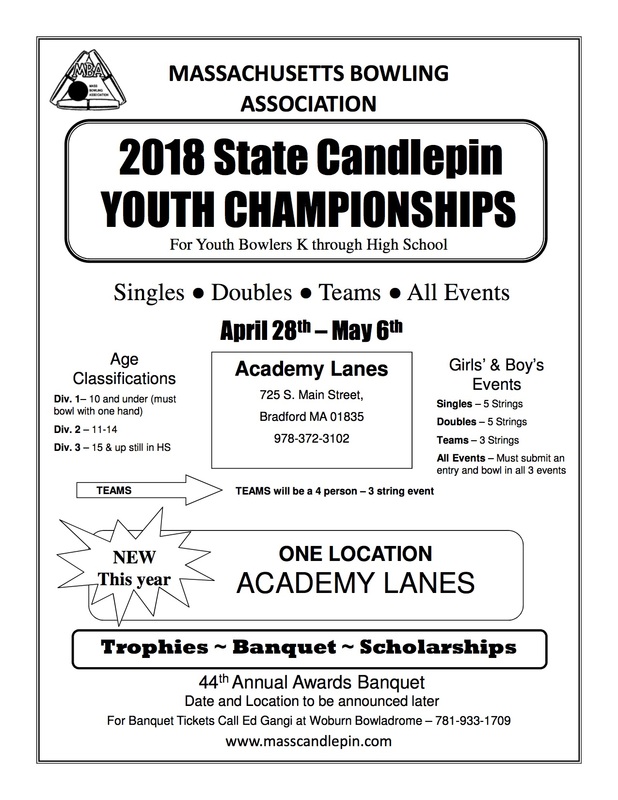 Results for the 2018 Youth Tournament Held At Academy Lanes. ​Each File Contains All Divisions. b. The bowler has NOT bowled competitively in an adult state or international tournament, adult TV roll-offs, adult Pro leagues or tournaments. Bowlers may only enter each event one time. Proof of WEEKLY participation may be required. AGE CLASSIFICATION – In Singles events and “All Events”, bowlers may only bowl in their own age group. In Doubles and Team events bowlers may move up to higher age groups. Age classification for Doubles and Team events are determined by the age of the oldest bowler. SAME BOWLING CENTER – Bowlers participating together in Doubles or Team events MUST COME from the same bowling center. EXCEPTION: Host Centers may supply “Substitute” bowlers to fill out Doubles or Teams when necessary. 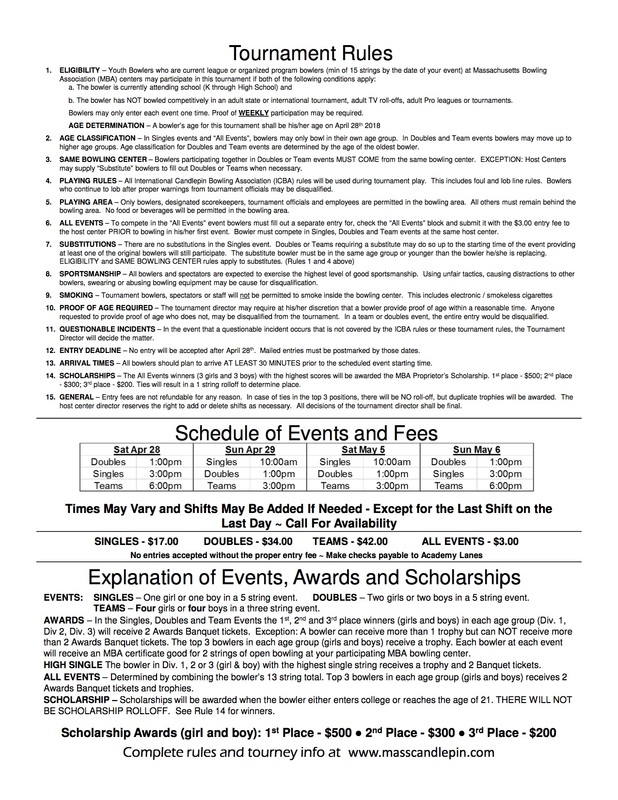 PLAYING RULES – All International Candlepin Bowling Association (ICBA) rules will be used during tournament play. This includes foul and lob line rules. Bowlers who continue to lob after proper warnings from tournament officials may be disqualified. PLAYING AREA – Only bowlers, designated scorekeepers, tournament officials and employees are permitted in the bowling area. All others must remain behind the bowling area. No food or beverages will be permitted in the bowling area. 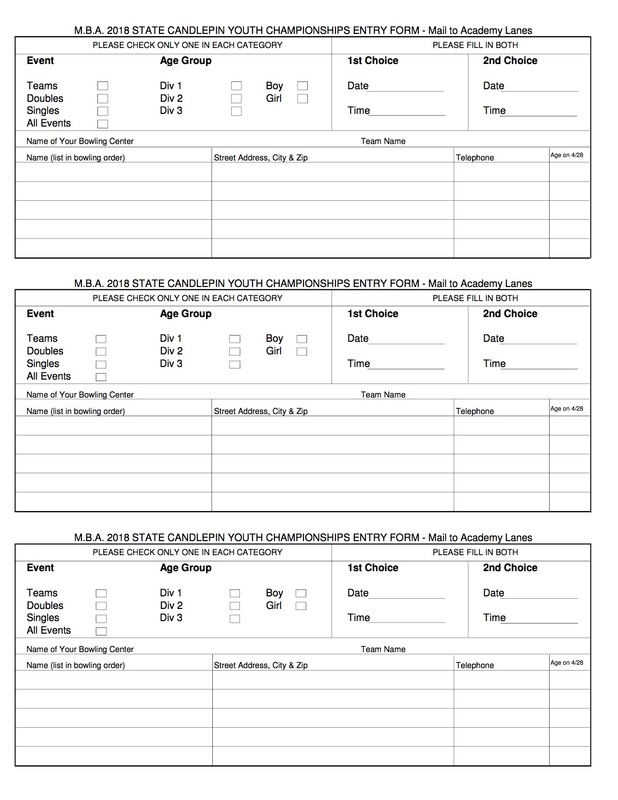 ALL EVENTS – To compete in the “All Events” event bowlers must fill out a separate entry for, check the “All Events” block and submit it with the $3.00 entry fee to the host center PRIOR to bowling in his/her first event. Bowler must compete in Singles, Doubles and Team events at the same host center. SPORTSMANSHIP – All bowlers and spectators are expected to exercise the highest level of good sportsmanship. Using unfair tactics, causing distractions to other bowlers, swearing or abusing bowling equipment may be cause for disqualification. requested to provide proof of age who does not, may be disqualified from the tournament. In a team or doubles event, the entire entry would be disqualified. QUESTIONABLE INCIDENTS – In the event that a questionable incident occurs that is not covered by the ICBA rules or these tournament rules, the Tournament Director will decide the matter. ENTRY DEADLINE – No entry will be accepted after April 28th. Mailed entries must be postmarked by those dates. ARRIVAL TIMES – All bowlers should plan to arrive AT LEAST 30 MINUTES prior to the scheduled event starting time. SCHOLARSHIPS – The All Events winners (3 girls and 3 boys) with the highest scores will be awarded the MBA Proprietor’s Scholarship. 1st place - $500; 2nd place - $300; 3rd place - $200. Ties will result in a 1 string rolloff to determine place. GENERAL – Entry fees are not refundable for any reason. In case of ties in the top 3 positions, there will be NO roll-off, but duplicate trophies will be awarded. The host center director reserves the right to add or delete shifts as necessary. All decisions of the tournament director shall be final.